Simon Callery’s paintings take a range of different forms, often jutting out from the wall, encouraging the viewer to experience them from different angles. Painting stretchers are used as supports for bold-coloured canvas that drapes over, or is wrapped around them, drawing attention to their physicality. Here, Dominic Beattie [FOLD gallery represented artist] talks to the artist ahead of his forthcoming solo exhibition with FOLD this Autumn. Dominic Beattie: If sculpture is something you bump into when you back up to see a painting, why do you think the floor is a suitable place for a painting? 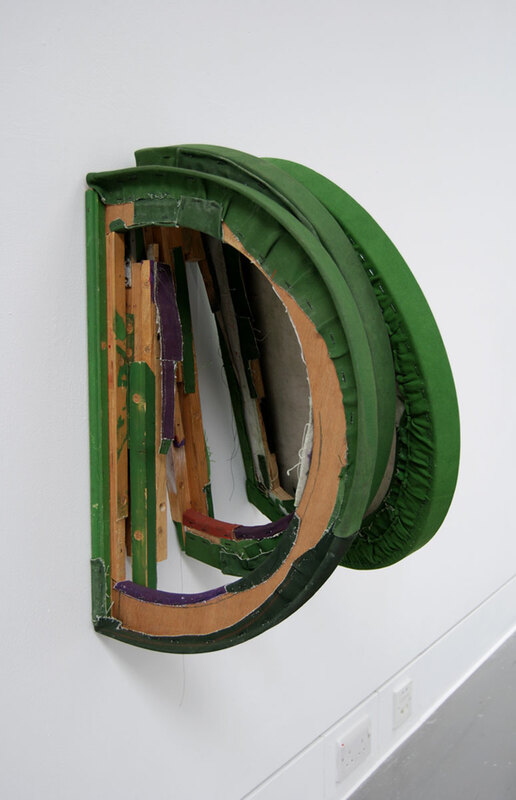 Simon Callery: Some of my paintings have been creeping down the wall. First from the accepted standard eye level down to hip height, then down to knee and ankle level and then down again to that vital point where the wall meets the floor. Some paintings have been made for that place and more recently some that have made for the floor. Since my paintings are not images, are not pictures, I can see that the conventions that define the ‘right’ place for a painting relate to its original function as a bearer of images. With image removed the place for a painting can be rethought. I like the idea that a painting can be an obstacle and an obstruction in the middle of the floor. This makes it clear that the painting needs to be encountered physically as much as it is visually. I can make paintings for the ankle and for the foot as much as for the eye. DB: Your works have become more monumental over the last few years, how big do you think they will become? SC: Scale is a crucial element. My paintings aim to call the attention of the body as much as of the eye. I recently made a painting for a show at Nottingham Trent University that was almost 5 metres high and projected 65 cms out from the wall. There is a tipping point in terms of scale where we no longer relate to an artwork on a personal and intimate level and it becomes impersonal and distant. The way I use scale, be it large-scale or small-scale, would take this equation into consideration and sensitive to what would be gained or lost. DB: Red, green, brown and black – why? SC: I do not see colour as symbolic and I do not attach any meaning to it beyond that generated as the direct response to exposure to the colour. I want my coloured surfaces to be compelling and tangible as material. I want the pigment to be bound in the fabric of the canvas rather than sitting on the surface as in traditional oil painting. My colour is made by mixing dry pigments with rabbit skin glue size and soaking it into the fabric when it is still hot. The most suitable pigments have tiny particles and are caught and held in the fibres of the cloth. Cadmium Red Deep, Lamp Black, Chromium Oxide and Burnt Umber all work. DB: How do you feel about your work influencing a younger generation of graduate painters? SC: I have never been interested in following the mainstream in art since if it already exists I can’t see any point in just making more of it. What I am interested in is seeing a sub-current beginning to gather momentum and to swell. I think an interest is growing in materiality in painting; in an attempt to make paintings that go beyond the visual and importantly a recognition and a place for artwork that provides an alternative to mainstream image based contemporary culture. Designed by Ben Carruthers Ltd.